Photofacial treatments are full face, neck, chest, and hand treatments using pulses of visible light that effectively improve the appearance of brown sunspots, facial redness, textural irregularities, and the visible signs of sun damage and aging. What exactly is a Photofacial? 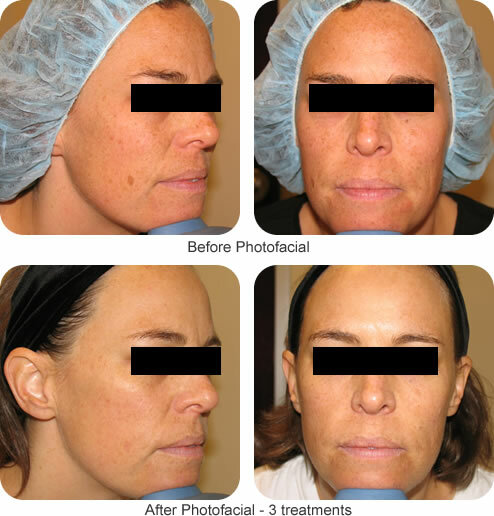 Photofacial is an innovative treatment that improves the skin’s pigmentation and texture with minimal to no downtime. A broad band light source device will be used for your treatment. Specific settings are selected for your skin type to maximize improvement with minimal risk and discomfort. After your first treatment, your skin’s pigmentation and texture will improve and results will become more visible after each treatment. Usually, three to five treatments are performed to achieve superior results. Maintenance treatments every 3 to 6 months are recommended for continued improvement. Photofacial treatments can be used in conjunction with Botox¨, filling agents, chemical peels, and microdermabrasion for enhanced results. What are the Indications for Photofacial Treatments? Photofacial treatments can be used on any part of the skin. They are especially effective for improving the appearance of the face, neck, chest, and hands. With these treatments, you can expect to see a gradual fading of sunspots, a decrease in overall facial redness, and a more even complexion. Individuals with visible aging from the sun can expect to see their skin become smoother, more uniform in color, with a decrease in fine wrinkles, and a reduction in pore size. What is a Photofacial Treatment like? Each treatment takes approximately 20 to 30 minutes. Many patients prefer to use a topical anesthetic cream which makes the treatment essentially pain free. This cream is applied for 10-15 minutes prior to treatment. Immediately following the procedure, the skin may appear red and flushed and tiny blood vessels may appear more visible. Brown spots generally appear darker. The redness usually fades over a period of hours to a few days. The brown spots will darken for a few days then gradually fade over the next week. A microdermabrasion will be performed 5 to 7 days after your treatment to improve and enhance the overall result of each treatment. After your first treatment, your skin will feel smoother and will have a more even tone. These improvements are gradual and will become more visible after each treatment. Five treatments are performed for optimal results. Occasionally, some patients benefit from an additional treatment or two. * People who also improve their appearance with Botox®, filling agents, glycolic/antioxidant peels, and microdermabrasion. Laborde Dermatology is a comprehensive Dermatology practice located in the Uptown/Galleria area of Houston, Texas. Specializing in Laser and Cosmetic Dermatology we serve patients through the Houston area, including Spring, The Woodlands, Tomball, Humble, New Caney, Conroe, Kingwood, Baytown, Pasadena and Sugarland. ©Copyright 2018 Laborde Dermatology | Houston Dermatologist | All Rights Reserved.